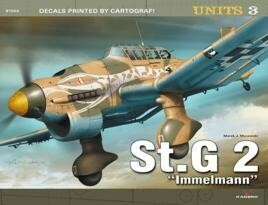 Named after first German World War I flying ace, Max Immelmann, in 1939 Sturzkampfgeschwader 2 (StG 2) Immelmann was a Luftwaffe Dive bomber-wing of World War II. The unit was originally formed as Fliegergruppe Schwerin in 1934; the first Stuka wing of its type, attaining the sobriquet 'Immelmann' in 1935. Named after first German World War I flying ace, Max Immelmann, in 1939 Sturzkampfgeschwader 2 (StG 2) Immelmann was a Luftwaffe Dive bomber-wing of World War II. The unit was originally formed as Fliegergruppe Schwerin in 1934; the first Stuka wing of its type, attaining the sobriquet 'Immelmann' in 1935. The wing was raised to gruppe status in 1939. Kagero present a fantastic coloured modelling guide for a stunning plane of World War I.